At Shire, supporting patients is at the heart of being a champion for patients. Beyond discovering and developing medicines, we are committed to dramatically shortening the time to diagnosis for rare diseases, and we aim to support patients along the entire patient journey, from conducting clinical trials to enabling patients to better manage their care through the use of innovative digital technologies, and beyond. To meet this commitment, Shire is co-chairing the Global Commission to End the Diagnostic Odyssey for Children with a Rare Disease, in partnership with Microsoft and EURORDIS, to develop a roadmap to address key barriers to diagnosis with actionable solutions. The Global Commission is collaborating with a team of experts to develop solutions and put into action findings through various initiatives. 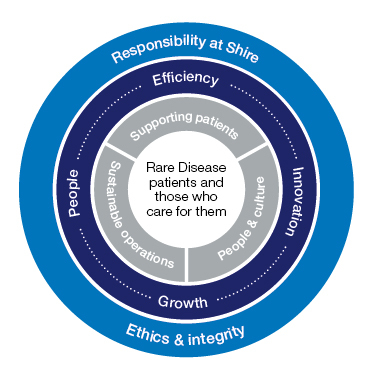 In parallel, Shire is advancing several key initiatives that accelerate diagnosis for rare diseases. See https://globalrarediseasecommission.com/ for more information. In order to continue to exceed disclosure requirements, lead in clinical trial transparency and maintain timely annual disclosure of 100% of applicable clinical trial data, Shire plans to share more data and results on historical studies, identify best practices, optimize systems to make clinical trial data more easily understandable, and enhance convenient clinical trial data accessibility. In addition, Shire plans to complete implementation of an automated centralized data-tracking tool for all studies registered, disclosed, redacted, and published across the organization. We are committed to patient care by developing innovative new medicines, making existing medicines more readily available, and removing other key barriers to care. We are also committed to providing financial assistance programs and partnering with advocacy groups to provide patients with the tools and educational resources to better advocate for their own health. We are working to continuously innovate, improve service delivery and build patient relationship platforms that provide more personalized services and better patient engagement by sharing experiences from around the globe. Through these commitments, we strive every day to raise rare disease awareness among key stakeholders and the public at large, empower patients, and make sure their needs are recognized. To learn more about Shire’s Responsibility commitments and goals, please visit Shire’s Annual Responsibility Review 2017 at www.shire.com/who-we-are/responsibility or view our latest video on Responsibility.